Traditional security camera systems have just been launched to the next level with our newest technology HD IP cameras. These new security cameras can be used to augment any previous security camera system to deliver alerts when someone approaches your property. Traditional IP cameras and analog security camera systems were set up to send alerts, but no one would use them, because of the fact that the camera system did frame by frame motion detection. Alerts would have been sent any time any motion occurred, which would mean a great deal of false alerts. However, with new SMART IP cameras, these cameras calculate the size, shape and speed of an object to determine if motion is because of innocuous changes on the screen or if it is due to a vehicle or person actually approaching the residence. These new SMART cameras really help take your security to the next level for your home. With one or two of these cameras added to your home security camera system with AVM, you can always know what is happening, no matter what. Once in place, our expert technicians will help calibrate the cameras so that they can properly calculate objects on the screen, and then help you set zones, which will be used to send alerts to your email or phone. With these cameras in place, you can set alerts based on vehicles entering your driveway, people walking onto your property, a person approaching your front or back door, children entering your pool area, and much more. Just having video evidence isn't enough, as a security camera system alone will only provide evidence of what happened after the fact, but a normal system won't tell you what is happening while it is happening unless you happen to be watching at the perfect time. At Platinum CCTV, that isn't enough for us, so we strive to bring you the newest and best technology, so that your home can truly become a SMART home. With this technology installed, you can truly know everything that is happening at your home in real-time. Each alert can be programmed based on time of day or other conditions, that way you can receive alerts only when you want them. 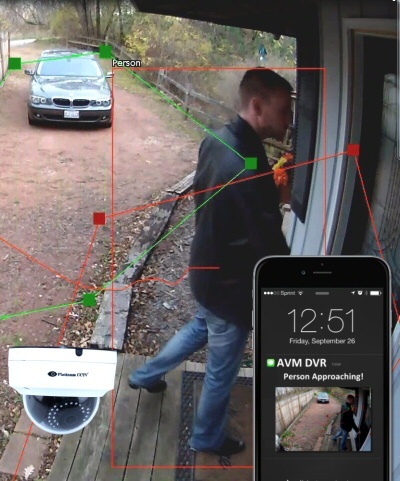 This is the birth of truly intelligent home security camera systems. If you are going to go through the expense of a home security camera system, don't settle for mediocre technology. Go for the best, and get a system that actually delivers you with real information in real-time without forcing you to watch it non-stop. Our AVM (Advanced Video Management) systems combined with SMART HD IP Cameras really deliver you the quality of video evidence, combined with system intelligence to deliver you with alets when you need them, so that you can respond to threats from anywhere. This is absolutely right. I was able to get one of these cameras added to my AVM system. Now I get alerts when people are entering my property and I couldn't be happier! I had problems before with neighbors, but was able to call the police when they started messing around on my property. Now they know to stay away.